Can fashion ever be ethical? And more to the point; can fast fashion ever be ethical? This point is discussed and debated in the world of ethical fashion on a regular basis. When I first came across the ethical fashion industry I think I was maybe a little too idealistic about the ethical labeling organisations and maybe a little too critical of the fast fashion industry. Either that or just maybe the fast fashion industry is improving. I think it's probably a bit of both but either way, I feel like I need to state the case for the fashion industry that in the past I may have judged rather harshly. The high street has come a long way since I first became acquainted with corporate social responsibility and ethical trade. In the beginning I cast my judgment upon the high street indiscriminately, failing to take notice of those brands that were seeking to change. To be fair, the brands that choose to seek more ethical ways of trading are not always the ones who shout about it. If we take a look at brands like ASOS and New Look, you might not immediately think of them as very 'green' companies but both are going above and beyond the average for where they sit within the industry. Big high street fashion retailers are obviously going to face challenges when trying to improve working conditions in supply chains that are hugely expansive, impossibly global and intrinsically complicated. But the positive aspect of their daunting size is the incredible impact that they are capable of creating. Just one small policy change can impact hundreds of thousands of workers lives. I don't think that we should be so quick to cast aside the huge changes big retailers can and do make to workers lives just because we judge that these changes are relatively small. In big business, a small change can have a huge impact. So I'm not saying that we have it right yet. I think that the high street has a long way to go but I do believe that there are some incredibly passionate people out there, behind the scenes, that are battling to make sure that the small changes have a bigger impact in an industry that is notoriously complicated and constantly challenging. So after much debate, I have finally decided to get on instagram. When I started this blog, I wanted to step away from the traditional fashion blogs which focus on outfit posts and in some cases present a fairly shallow view of fashion. I wanted to get under the skin of fashion and look into it on a deeper level- be critical and exploratory. In a bid to avoid a casual representation of fashion and not to allow the debates within the industry to be sidelined, I had decided to limit the amount of outfit photos I posted. However, this meant that although the 'ethical' side of my blog was covered, I somewhat found myself lacking in the 'fashion' department. In order for ethical fashion to thrive, if it wants to break out of the niche, hit the mainstream and become not just 'ethical' fashion but 'fashion'; then it needs to be just that. Ethical fashion cannot rely on the fact that it is produced in a humanely and environmentally sound manner to sell. It needs to be desired for its aesthetic. For its beauty. 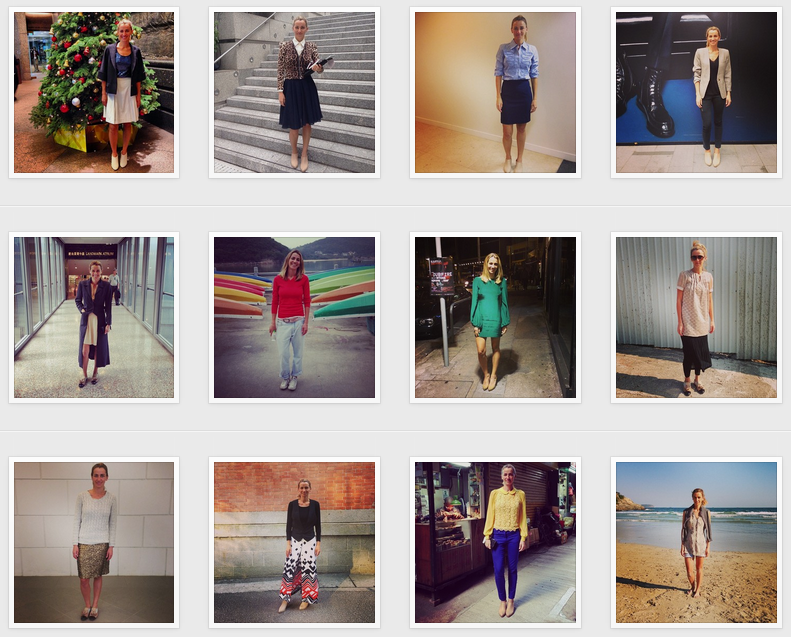 This week I stumbled across an incredible ethical fashion initiative on twitter. Redress is an NGO with a mission to promote environmental sustainability in the fashion industry by reducing textile waste, pollution, water and energy consumption. They are involved in many aspects of the fashion industry including design, certification, campaigns and industry engagement. I came across their 2013 consumer campaign The 365 Challenge 2013 in which founder Christina Dean wore only dumped or discarded 2nd hand clothes every day for a year to promote the durability of clothing in their 'Redress it, don't bin it' concept. Take a look at her inspirational daily outfits, which were created by 12 fashion stylists and have monthly themes, on their instagram page. For 2014, Redress have a new campaign which allows you to get involved. 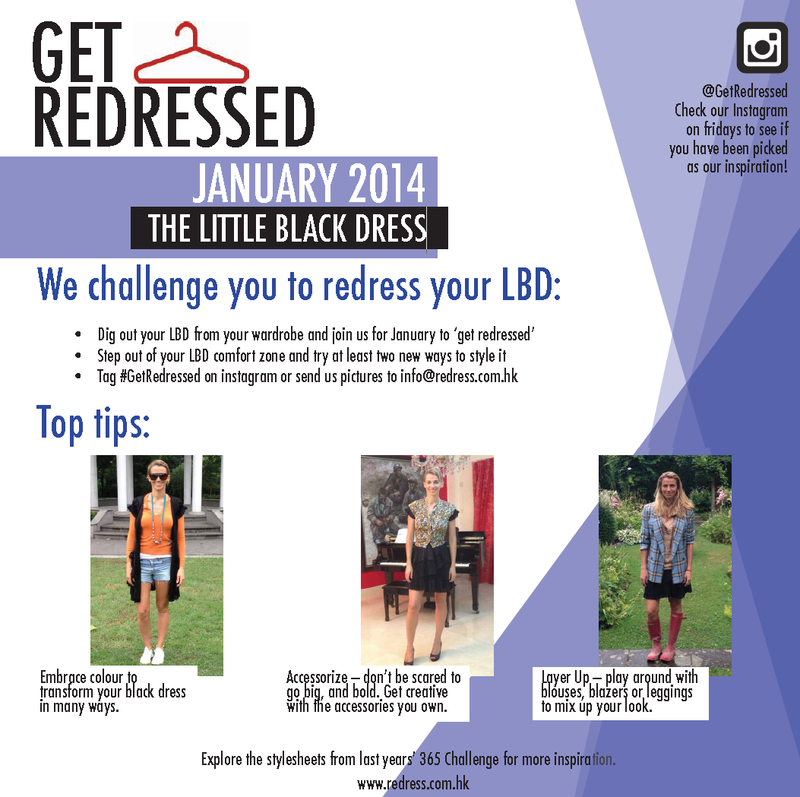 The Get Redressed Challenge 2014 invites you to join them on a styling journey throughout the year. Each month there will be a new challenge sheet released explaining the months sustainable fashion theme. 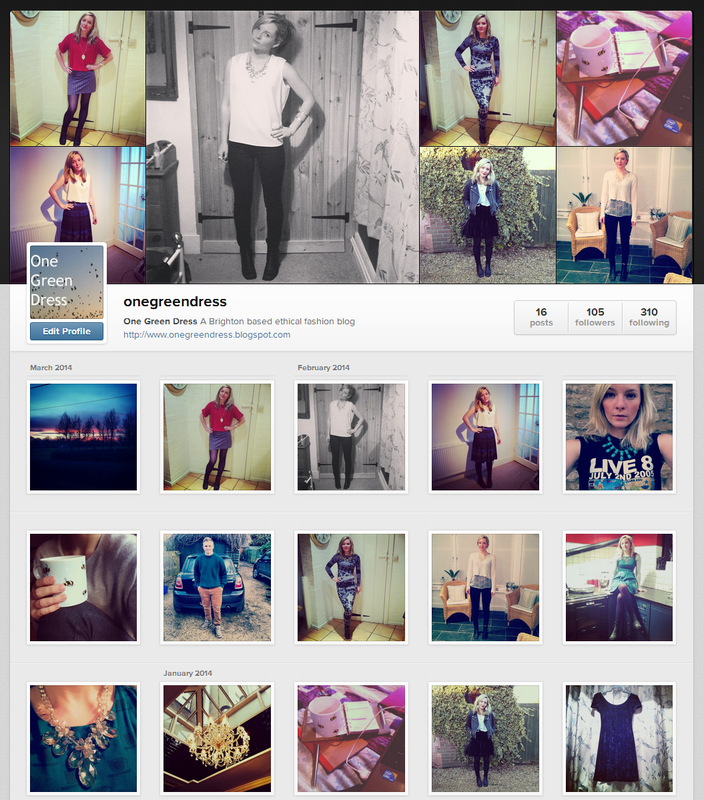 Everyone is encouraged to get involved with the challenge and share their ethical fashion outfits on instagram. Check out this months challenge below! Redress is a great initiative and is a really fun and positive way of getting involved in ethical fashion. Here at One Green Dress we will be joining the challenge so keep an eye on the blog for our monthly contributions. Will you be getting involved? 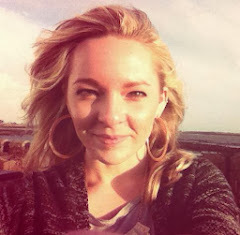 It's Blog Action Day 2013 and this year we, as a collective, are focusing on human rights. As an ethical fashion blogger I've looked at the Rana Plaza factory collapse in my previous post and now I'm doing an outfit post to show you how you can use fashion to promote the proper enforcement of human rights. In this picture, I'm wearing a top and a pair of boots both bought from Oxfam. 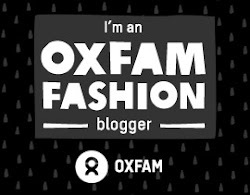 Buying from Oxfam not only promotes the reduction of consumption and waste in the fashion industry but also gives to an incredibly good cause. Oxfam is committed to reducing poverty around the globe and promoting human rights. This top is actually originally from Edun- an ethical fashion brand which uses Fair Trade in its supply chain and promotes use of the African fashion industry. Fair Trade strictly promotes human rights in its labour policies. The skirt is from People Tree- pioneer of ethical and Fair Trade fashion and the first fashion brand to be accredited by the WFTO. People Tree is committed to providing long term jobs to those who need them most and creating beautiful items of clothing in the most human and environmentally friendly way possible. By choosing to shop from ethical, Fair Trade, second hand and charity fashion brands; we can make a positive difference to peoples lives around the world and throughout the supply chain. Our purchasing power should not be over looked. As consumers we hold immense power over fashion brands; their supply meets our demand- if we demand better, they will have to provide. 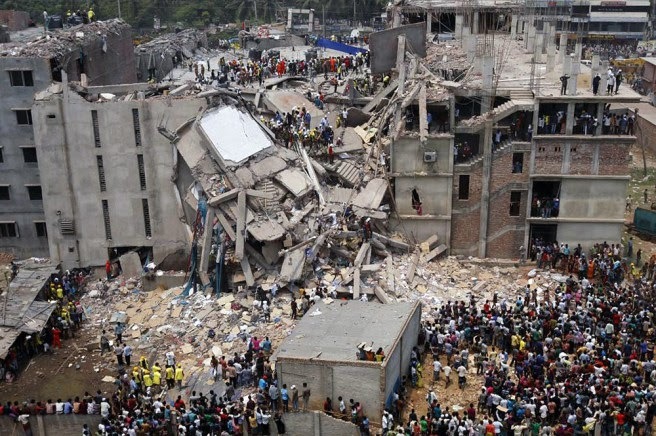 The Rana Plaza factory collapse in Bangladesh opened up the worlds eyes to a problem that has been ignored for too long. The garment industry has been employing labourers around the world without being fully aware of how human rights are being enforced or simply disregarded. This is mainly due to fashion brands out-sourcing labour and refusing to own the factories that produce their garments. In the past, this has relinquished them from any responsibility for factory safety upkeep and working conditions but now people are starting to question this chain of accountability. The fashion industry's supply chain is notoriously long and complicated; spanning many countries and cultures, travelling thousands of miles, passing through countless pairs of hands. This is where the problem of accountability and responsibility arises. Who do we look to, to enforce human rights throughout the supply chain? Well I think that we all need to chip in. When a person's human rights are denied, we have a collective responsibility to speak up. Governments around the world should all be moving towards introducing not only minimum wages but living wages. There are some fashion brands that are already providing this for their employees around the world and I hope to see others follow in this vain. As consumers, what can we do? Well, we can demand more. We can call out the retailers that are disregarding human rights, we can promote the ones that are enforcing them and we can cast our vote with our money by letting our purchasing power do the talking. After the Rana Plaza disaster, the 'Accord on Fire and Building Safety in Bangladesh' was drafted by Uni Global Union, IndustriALL and NGWF. It was put forward to all the fashion companies producing garments in the city. Under the accord, garment workers can refuse to work in unsafe conditions and must continue to be paid under these circumstances until the issues are resolved. The fashion brands were not eager to sign, with some major hesitations from; Matalan, Edinburgh Woolen Mill, J D Sports and River Island. We are still waiting for Peacocks and Sports Direct to sign. The fashion companies complicit in the Rana Plaza disaster were invited to Geneva to discuss setting up a fund for the victims. Of the 29 companies involved, only 9 turned up and only Primark contributed to the fund. It's time for us to call upon these fashion brands to become accountable to their workers. You can call on Peacocks and Sports Direct to sign the Accord via the See Through Fashion campaign here. You can also chose to cast your consumer vote wisely by shopping for clothes using ethical fashion brands that enforce living wages and by buying second hand from charity and vintage shops. As the seasons change we inevitably end up looking into our wardrobes and altering them to fit in with the new nips and chills that we are challenged with daily. Autumn is probably my favourite season. I love the colours that are thrust upon us in the turning of the leaves; I love how crisp the mornings become with dew and mist and fog. I love seeing my breath in front of me.